This post is the second in a series that addresses the 2014 Draft New York State Energy Plan and some public reactions to that plan. While this commentary relates to New York State and its energy planning most directly, the nature of what is happening here related to energy is instructive for both other areas of the country and for other controversial topics. The State Energy Planning Board is accepting comments on the Plan through April 30, 2014, so this is also a nudge to encourage people to comment. These reflections were inspired by my participation in a public meeting about the Plan on Tuesday, February 25, 2014 at the University of Buffalo. I’ll say a (very short) bit about the Plan. Then I’ll blend together a bit about the meeting with reflections on its implications for those engaged in energy education and activism. I’ll include in that discussion some feedback for the Plan that might have implications for policymakers and activists. The Plan lays out 15 Initiatives as the center of a set of documents totaling 682 pages. Find those documents here. The short version of the initiatives is in the box below. Included in the Plan’s goals is the reduction of carbon emissions from the energy sector 50% by 2030 and 80% by 2050. THE 2014 DRAFT NEW YORK STATE ENERGY PLAN INITIATIVES. Within the Plan, each Initiative is further explained with between one and nine bullet points. The Initiatives are detailed on pages 31 – 49 of Volume 1. Initiative 01: Realign energy efficiency policies to work with and through markets in order to accelerate the pace of energy efficiency deployment while fostering continued economic growth in New York State. Initiative 02: Enable and facilitate new energy business models for utilities, energy service companies, and customers to be compensated utilization of all behind-the-meter resources that can reduce the need for new infrastructure through expanded demand management, energy efficiency, clean distributed generation, and storage. Initiative 03: Establish and implement building codes and standards that will help support energy efficiency and clean energy. Initiative 04: Establish a $1 billion New York Green Bank to unlock and mobilize private sector capital for greater investment in New York’s clean energy economy. The Green Bank will work to eliminate current market barriers and fill financing gaps by partnering with private sector intermediaries through the use of various forms of financial support such as credit enhancement, warehousing, and securitization, making a much larger supply of private capital available to finance clean energy projects. Initiative 05: Coordinate renewable energy policies to strategically harness the many resources that the State can provide to solar, wind (offshore and land-based), bioenergy, geothermal, hydrokinetic, storage, and other power supply options. Implemented strategies should take into account the opportunities provided by the diverse renewable resources available in different regions of the State. Initiative 06: Update and modernize electricity and gas delivery systems to replace aging infrastructure and ensure service quality and reliability with a more integrated and distributed energy network. Initiative 07: Support community-based energy planning and facilitate public-private partnerships to develop smart, integrated energy networks to spur regional economic development. Initiative 09: Reduce reliance on petroleum products for heating buildings by supporting the use of clean alternatives to heating oil and expanding access to natural gas in the near term while pursuing strategies to reduce natural gas leakage. Initiative 10: Give customers more choice and control of their energy usage to determine what services they value by cultivating a more competitive market around home energy solutions. Initiative 11: Provide improved information and access to energy-related data to support customers’ ability to make educated decisions about clean and efficient energy investments, including labeling mechanisms for commercial and residential buildings. Initiative 12: Increase transportation alternatives and vehicle diversity to harness the benefits of decreased dependence on oil and a cleaner, more connected, and more flexible transportation sector. Initiative 13: Bring innovative information technology to transportation system users to support more efficient and safe travel. Initiative 14: Encourage clean technology innovation and commercialization to maximize the economic impacts of a vibrant private sector in New York. Initiative 15 Foster a clean energy workforce targeting participants across all aspects of the energy sector. The Plan seems to focus largely upon transitioning away from fossil fuels and includes a fair amount of attention to reducing energy consumption. You wouldn’t know that if you attended the meeting I did. The structure of the meeting was simple. It wasn’t for the Planning Board to provide information to the public. It was solely for the purpose of the public to give feedback to the Board. People who wished to speak signed in before entering the meeting room and were given numbers indicating their place in the queue. I was number 29. Each speaker was given five minutes to speak. At least 25 of the 28 speakers who preceded me directed their comments primarily to fracking. Clearly, a great many people were passionate about what they addressed – many choked back tears and at least one let out a few full sobs. People are clearly scared. It was powerful testimony, but too many people said things that simply aren’t true. That doesn’t make their fear or their passion any less real, but it raises important questions. Most of the speakers seemed not to know where New York State energy comes from now, yet they are strident about how the system needs to change. This was not about the New York Fracking Plan (which remains a great unknown), it was about the Draft New York Energy Plan, yet nearly every speaker focused primarily upon the process that’s been nicknamed fracking. Fracking is addressed in the Plan, but it is hardly the focus, and it is noted that there is currently a moratorium on high volume hydraulic fracturing in the state. It would be utterly irresponsible to ignore fracking or to make assertions that it either will or will not happen in the state. Because of the moratorium and the uncertainty of its future, the Plan makes two sets of predictions – one for if the moratorium is lifted and another for if it is not. See page 18 of Volume 2: Sources. Indeed, the draft plan sets a goal of reducing greenhouse gas emissions by 80% by 2050 and pays a great deal of attention to energy conservation. An 80% reduction in emissions is not possible without moving away from fossil fuels including fracked gas. The Plan focuses largely on solutions yet speakers focused largely on fear. While fear can serve as a motivation for some people in some contexts, it often drives people to tune out. “I’m terrified – why aren’t you more like me?” is not part of an effective recruiting strategy to get people to join your cause for the long haul. Good decision-making requires good information. What was most troubling to me was that most speakers seemed to not know where we get our energy from now, yet they have passionate feelings about where it should and should not come from. Further, an overnight transition of our energy infrastructure is simply impossible and would be tremendously wasteful if it were possible. It requires energy and time to make infrastructure. Right now, we have one kind of infrastructure and we need another. Data from: http://www.eia.gov/state/?sid=NY#tabs-1. On pages 19-20 of Volume 2, End-Use Energy is a graphic that includes similar data along with the total amount of energy generated, and energy lost in conversion. 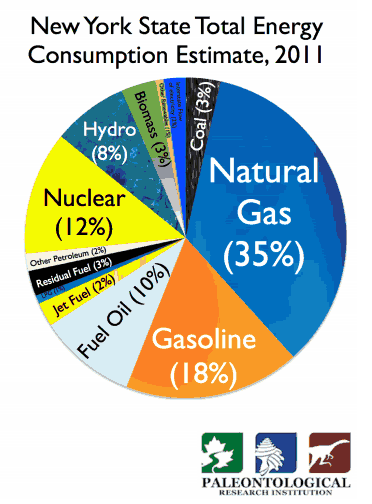 That graphic also shows all petroleum products together and, taken together, energy generated from petroleum nearly equals that from natural gas. Why do I think most speakers didn’t know where our energy comes from? I asked. After watching the 28 speakers who came before me, I discarded my prepared remarks and instead asked the audience the question I asked readers in Part 1 of this three part series of blog posts. I asked them to raise their hands to indicate what they thought were the largest sources of energy for electric generation in the state. Many, I think most, in the room participated in the polling – but not a single person correctly identified natural gas and nuclear power as the two largest sources of power for electric generation in New York State. I wonder how we can make informed decisions about our energy future if we don’t know where we get our energy from now. Don Duggan-Haas is Director of Teacher Programs at the Paleontological Research Institution in Ithaca. Along with colleagues Robert Ross and Warren Allmon, he authored The Science Beneath the Surface: A Very Short Guide to the Marcellus Shale.